Samsung is now pushing a new firmware update to the Gear S3 units sold in the US. 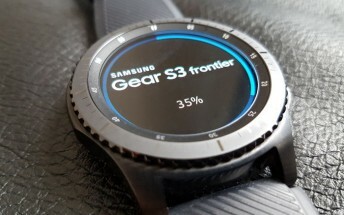 For now this was only spotted on a Gear S3 frontier unit purchased from AT&T, but we assume the Gear S3 classic will get it too - as well as watches sold by other carriers. This should all happen in the following days. After you apply the update you'll be running Tizen 2.3.2.3, which is the same one that was rolled out to Gear S3 smartwatches in Europe back in March. The new software version ends in BQD4, though, unlike the BQC5 release that made it to the EU. Once your watch is running the new software, you'll see a few new features: new date and music complications for watch faces, an altitude auto-refresh option, customizable pace-coaching and HR zone info for running, as well as an improved UI for News Briefing. S Voice now lets you set a date and time for reminders, TTS is an option in the Input menu, the maximum time for the stopwatch is 3 hours, and the DIRECTV app has been updated. Additionally, you'll find new apps in the Galaxy Store - Spotify, BMW Connected, Gear for Nest, Facer, and NYC Transit.